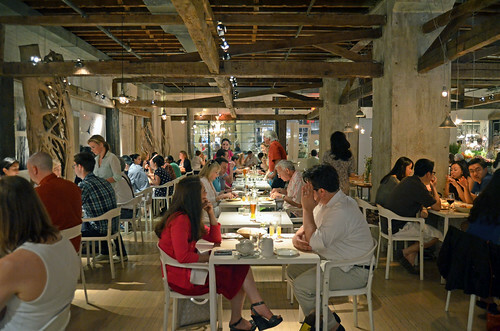 Our first meal during this New York City weekend was brunch at abc kitchen with Mr. and Mrs. HaveShoesWillEatandTravel. This was particularly exciting because they live in Chicago and happened to be in NYC the same weekend we were! Adding to the excitement was the fact that Mr. Shoes didn't know we were meeting them for brunch because it was a surprise birthday weekend for him! abc kitchen is brought to you by the famous Chef Jean-Georges Vongerichten. 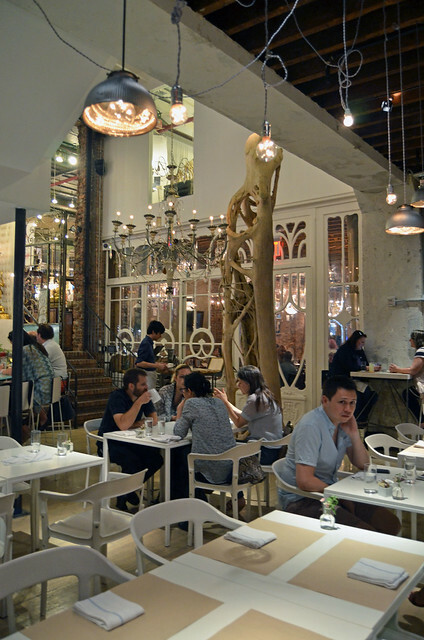 The restaurant is filled with local, salvaged, recycled, and reclaimed materials. 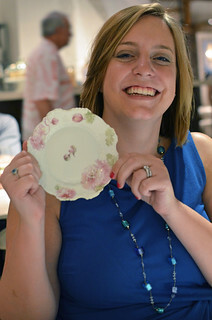 Plates -- as modeled by Ms. Shoes and Mr. Monkey -- are flowered and purposefully mismatched. Quite the eclectic look all around. 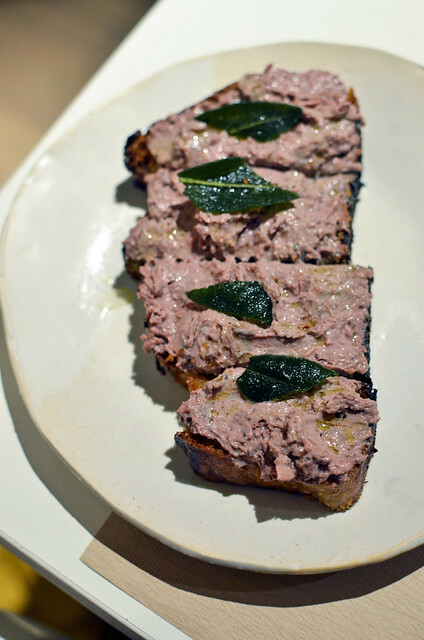 The beauty of the food at abc kitchen lies in its simplicity. There are no muddled flavors here, only superb ingredients and superb preparation. 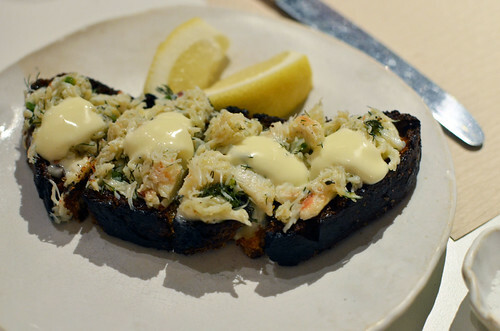 Crab toast with lemon aioli ($15). A fresh taste of the sea right in your hand. 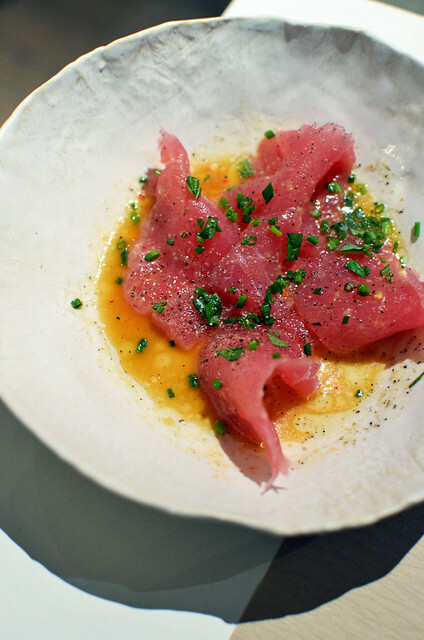 Line-caught tuna sashimi marinated with ginger and mint ($16). As luscious in your mouth as it is beautiful on the plate. Brunch Special #1 ordered by Ms. Shoes. 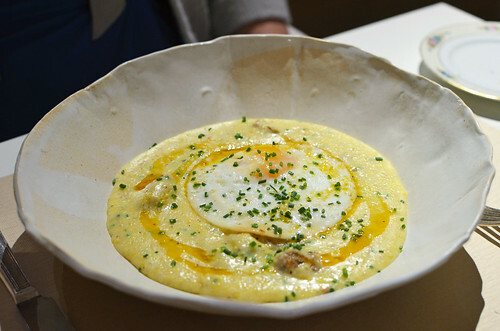 I think this was sausage, egg, and either grits or polenta (or maybe even polenta grits). Whatever it was, it was fantastic, and we were very happy that Ms. Shoes shared. Brunch Special #2 ordered by Mr. Shoes. This raviolo was gorgeous and eggy when punctured. We were glad Mr. Shoes shared, too! 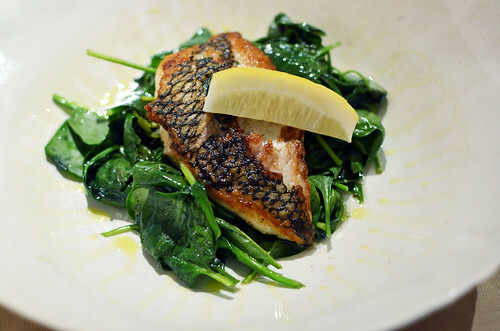 Roasted black sea bass with chilies and herbs, spinach, and basil ($29). My fish was lovely, but it was not a standout. I think I had the loser of the day, but even this "loser" was very good. 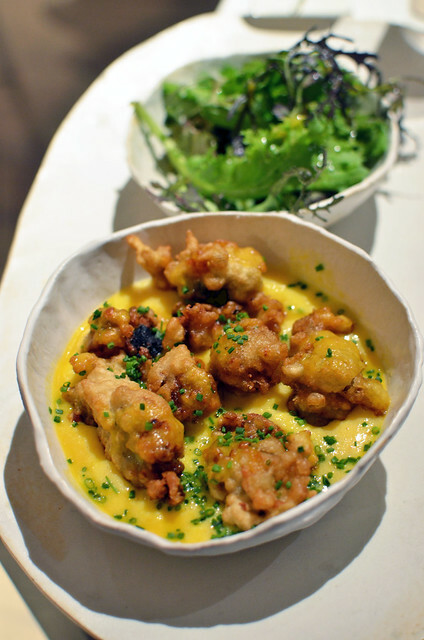 Scrambled eggs, crispy oysters, and hot sauce butter ($21). Mr. Monkey's entree was undoubtedly my favorite. Hot! Sauce! Butter! No, seriously, people. It was fried oysters swimming in buttery scrambled eggs with hot sauce all mixed in. Crazy delicious. The sharing continued during desserts! 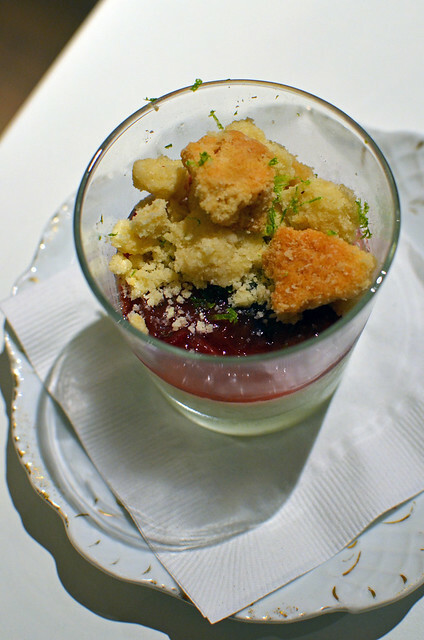 Toasted almond panna cotta, rhubarb jam, and crumble ($11). Not too sweet and just tart enough with the jam, crumble, and lime zest. Loved this. 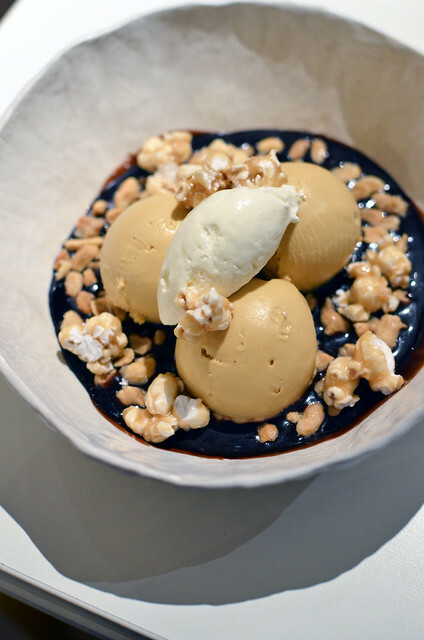 Salted caramel ice cream, candied peanuts, popcorn, whipped cream, and chocolate sauce ($13). This was like Cracker Jack in sundae form. In other words, yum! 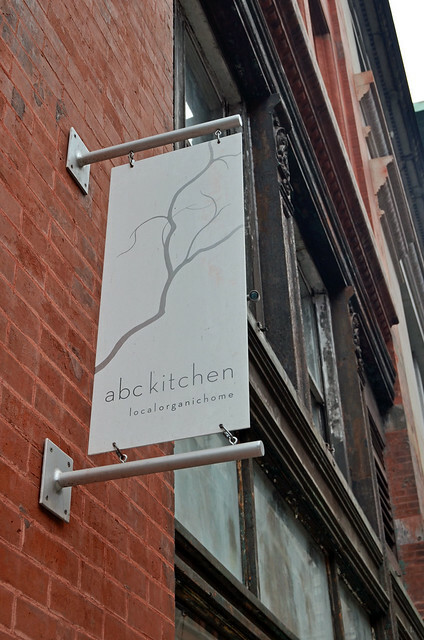 abc kitchen deserves all the love it gets. 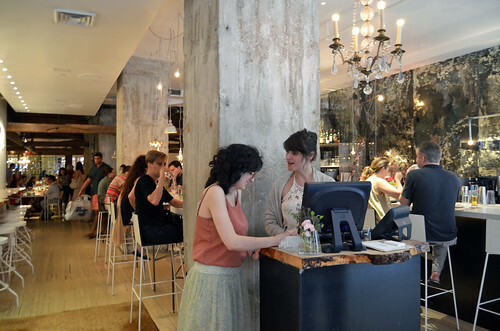 Our meal was excellent and was made even better by our fun, youthful Chicago versions of us. It was a blast brunching with you again, Mr. and Mrs. Shoes! Bonus: ABC Carpet & Home (the awesome furniture place connected to abc kitchen) tweeted this post! The beautiful colors are jumping out at me! Such pretty photos. I love friends who share delicious food! So fun. Thanks, Grace! The Shoes are such a great couple! 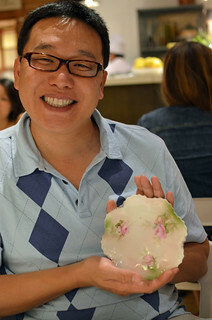 Jean-Georges Vongerichten is my boyfriend! 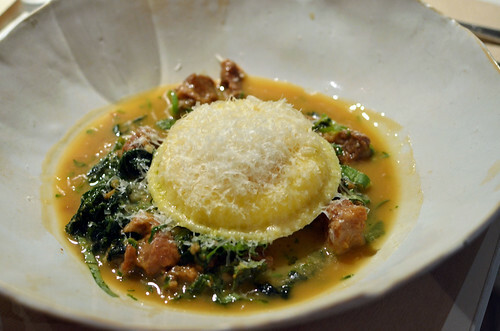 I want that raviolo so badly! Oooh, this all looks fabulous! cracker jack sundae. i want it. i actually want everything here, with the exception of the chicken liver. i just can't do liver. i need the oyster dish.